Kasey Isaacs is currently a Junior at Morehead State University and is pursuing a Bachelor's degree in Biomedical Sciences, with an emphasis in Pre-Medicine. He spent three weeks on an Atlantis Clinical Shadowing Fellowship in Milan, Italy in Summer 2017. He is also the recipient of the Atlantis Pre-med Leaders Scholarship. The following is his thrilling testimonial, all pictures and captions are Kasey's own. Full disclosure: Kasey is an Atlantis Author, an independent contractor position with Atlantis. Atlantis was seemingly tailored to all our wishes. It offered the chance to travel to several available locations in Europe or South America, facilitated 20 hours of shadowing local physicians per week, and all the while provided enough free time to explore a foreign country. Think about the last time you were presented an opportunity that some would deem “crazy”. Can you think of any? I can. I am a firm believer that in life it is sometimes necessary to do exactly those things that some may deem a bit “crazy”— a dash of eccentricity can go a long way when you want to spice up an otherwise monotonous schedule, especially that of a pre-health student. This type of thinking landed me halfway across the Atlantic Ocean, seated beside my fiancé on the first plane ride of my life. You read that right! I was leaving the United States of America for the first time ever, bound for Milan, Italy. My lack of travel experience was due equally to both insufficient time and insufficient funds, a state commonly referred to as being in college. However, with the realization that neither of these variables were likely to change in the immediate future, I decided that the importance of time and money paled in comparison to that of new experiences, and thus the adventure began. Kasey and his fiancee lounging beside a Venetian canal. 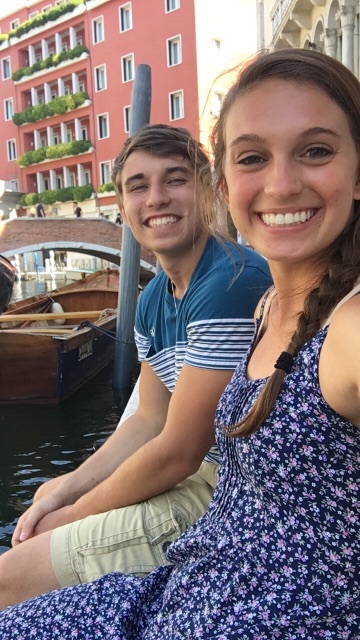 Nearly a year before, around mid-August, my fiancee and I had begun searching for an overseas experience that fit our interest in medicine. As members of the Honors Program at Morehead State University in Morehead, Kentucky, we were expected to spend a minimum of three weeks in another country, in an effort to broaden our horizons. A quick internet search revealed the nearly endless stream of study abroad programs, but none fit our bill. The focus was nearly always on the Humanities or Mathematics, worthy disciplines to be sure, but not altogether fitted to the needs of a couple with an interest in medicine. Then we found Atlantis. Here was an opportunity to shadow physicians from an entirely different background and culture, an opportunity to obtain perspective rarely afforded to anyone, let alone a 20-year-old from Eastern Kentucky. The Duomo, the magnificent centerpiece of Milan. As a bit of a history nerd, the idea of traipsing along on the same paths once trod by the Romans captured my imagination, and so our sights narrowed toward Italy. Furthermore, the program addressed my fascination for the medical field in an almost surreal sense; here was an opportunity to shadow physicians from an entirely different background and culture, an opportunity to obtain perspective rarely afforded to anyone, let alone a 20-year-old from Eastern Kentucky. A view of the Alps, complete with picturesque valleys and lakes. This, then, is where the crazy enters. Never before had I been on a plane, nor really any other type of public transportation. I had also never been outside of the United States (in fact I had only been across the Mississippi once). Between the two of us, my fiancé and I could stumble through five words in Italian, two of which were different versions of “hello”. And finally, the opportunity (although reasonably priced) was a stretch for our humble budget. In what some may call an act of courage (and others the short-sightedness of youth), we sent in our applications to Atlantis anyway, and after being interviewed we were accepted as fellows for a three-week trip to Milan, Italy. We were fortunate to both receive the Atlantis Pre-Med Leaders Scholarship (which alleviated the financial burden considerably), and before we knew it, we were on our way. How does one condense such an experience into a palatable piece of writing? Explaining every sensation, every introduction, every thought, every weekend trip, and every amazing experience at San Raffaele Hospital would require volumes. However, experience tells me that such a treatise would not only go unread, but also unwritten. Bearing this in mind, I will simply do my best to summarize a few highlights of the journey, with as much honesty and clarity as I can muster. Upon first arriving in Milan, I suddenly realized I was a foreigner in more ways than one. Milan, with a population of well over 1.36 million, was a far cry from my hometown of 4,000. Dorothy’s famous line from The Wizard of Oz had never been more applicable. Navigating trains, metro stations, and buses—difficult for a novice in any case—becomes a serious endeavor when one does not speak the local language. I was required to constantly think on my toes. Never before had I faced such adversity in a social context, and I was admittedly overwhelmed at first. However, the company of my fiancé allowed me to hold fast, and as our site managers led us to the hospital on the first day I felt a newfound optimism. Kasey donning scrubs in preparation for the first day of shadowing. After orientation I was placed in an Ophthalmology shadowing rotation for the first week, and on the very first day I was given the opportunity to shadow during three different surgeries. The work was fascinating, but clearly not for me, as watching the surgeon carefully perform operations on such a delicate organ frankly made me a bit flushed. These surgeries were the first I had ever seen in person, and though I was slightly concerned about my weak stomach, I later found that such uneasiness was as much a result of first-day nerves as it was a result of the specific operations in question. A week later, I was able to watch the extremely fascinating surgeries within the thoracic surgery unit (including a lobectomy and a pneumonectomy) without such feelings—a great relief. Indeed, the surgeries I witnessed while shadowing the Thoracic Surgery Unit marked some of my best time spent in Italy and produced an interest in surgery that I had never previously considered. 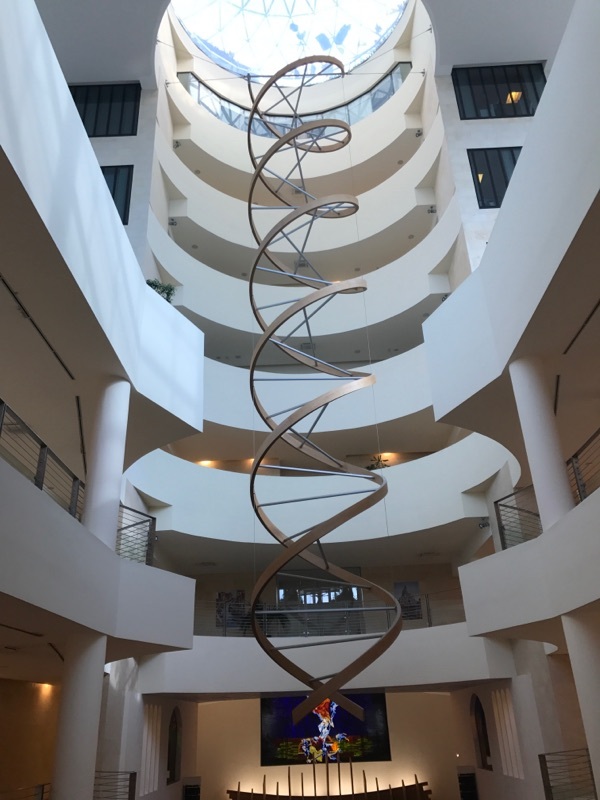 The enormous sculpture of DNA found in the main building of Universita Vita-Salute San Raffaele, the medical school associated with San Raffaele Hospital and the primary meeting place throughout Kasey's shadowing experience. The warm welcome I received from the members of this unit parallels the attitudes and genuine nature of the Site Managers, and I consider this rotation one of the hallmarks of my trip, not only because of the shadowing experience, but also because of the friendly faces and wonderful personalities that graced the Thoracic Surgery Unit. We were able to take several trips during our free time, some through Atlantis excursions and others through private means. Though I do not regret a single trip, I can honestly say that the shadowing and hospital experiences truly outshone our travels, perhaps a testament to both my personal preferences as well as the atmosphere of the hospital itself. In Kasey's words: "The Colosseum, a structure so large and impressive that I found I difficult to believe it was built nearly 2,000 years ago. " We travelled to Rome, Venice, Genoa, Lake Maggiore, and a small coastal town called Sestri Levante, among other sites. Unfortunately, it became clear that such places were simply not for me. Yes, the works of the ancients were truly awesome, with structures like the Colosseum and the Pantheon practically radiating the history they had witnessed. Some structures, like Milan’s own Duomo, were unimaginably magnificent in both size and quality, and indeed I doubt that many man-made structures could claim to be the equals of such powerful architecture. However, the magnificence can serve as a detracting agent, as such qualities attract men and women from all over, which leads to the inevitable implementation of tours, lines, protective rails, fees, and of course the ever-present street peddlers who seem unable to understand “I am not interested” in any language. Toward the end of our three-week stay I found myself longing for the ability to escape the crowds, to wander off into the woods and find solace in nature. I am not naïve enough to think that no such place exists in Italy, but I became keenly aware that reaching such places as an outsider is no simple task. This fact was due largely to the popular notion that when one is in Italy, one must see endless numbers of architectural and artistic masterpieces, with little thought given to the natural beauty that is sure to exist beyond the cramped city streets. By our last weekend in Italy, my fiancé and I decided that such advice (though given in good spirit) could not account for our personal tastes. As such, I looked up a small town on the coast that offered a beach, as well as a less dense population. Sestri Levante, a quaint little coastal town with a small beach, seemed to fit the bill perfectly. Our last Sunday in Italy was spent soaking up the sun, enjoying the white sand, the beautiful clear water, and above all the peace that comes with a place that is not entirely inundated with tourists. My time in Italy was truly a period of personal growth and character development. I traveled there in a bid for adventure, as a chance to take part in a truly unique opportunity that would allow me to see the world and healthcare in a new light. I thought that it would be a simple trip, perhaps shedding some light on variances in healthcare while allowing a bit of sightseeing. Instead, I found myself within a truly unforgettable experience. I discovered that the borders between city and countryside equal (or perhaps supersede) those of national origin. I found that the relationship between a doctor and a patient—the trust involved, the tears, the laughs, the hugs, the sorrow, the joy, and the bond—is universal. In doing so I confirmed my draw to medicine. I began to see medicine as a chance to take part in this wonderful relationship between doctor and patient by providing the very best care possible. And, ironically enough, I traveled 4,500 miles to find out that the place where I wish to provide that care is right outside my own back door. Kasey grew up on his family farm in Grayson, Kentucky, a small town nestled in the foothills of the Appalachian Mountains. He is currently a Junior at Morehead State University and is pursuing a Bachelor's degree in Biomedical Sciences, with an emphasis in Pre-Medicine. He intends to practice medicine in or around his hometown, with a current inclination towards internal medicine. In his free time he enjoys the company of his family and friends as well as a variety of activities including archery, target shooting, wake-boarding, camping, hiking, repairing cars or other machinery, and reading. Your AMCAS was sent in months ago, your interviews are complete and you’ve been accepted or waitlisted by several schools. It’s exciting to imagine yourself in this scenario, but there’s one final hurdle to jump: choosing among your options. As spring rapidly approaches, bleary-eyed pre-med students are emerging from the science halls of universities across the nation to begin preparation for the MCAT. Studying for this infamous exam is a herculean task in itself, and the logistics shouldn’t add extra stress to the process. In a sea of impressive GPAs and MCAT scores, there is one weapon you can sharpen to leave a memorable mark on the admissions counselors -- your personal statement. If you’re struggling to make it your one-hit wonder, keep reading for tips on how to get started and what NOT to do. Picking the right pre-med program is key to starting on the right track to medical school. With so many options, it can be overwhelming. Learn five things to keep in mind as you pick your pre-med program. My Story of Resiliency | Dr. Lisa Gilbert, M.D.